When Jesus had finished - More literally this reads "And it came to pass, when Jesus ended...."
Finished (5055) (teleo from telos = end, goal) means to complete something and bring to an end. The idea of teleo is not merely to end it, but to bring it to perfection or its destined goal. The Sermon on the Mount had been achieved His goal, not only terminating His discourse but carrying it out to the full. John 7:43 So there arose a division in the multitude because of Him (Jesus). 44 And some of them wanted to seize Him, but no one laid hands on Him. 45 The officers therefore came to the chief priests and Pharisees, and they said to them, "Why did you not bring Him?" 46 The officers answered, "Never did a man speak the way this man speaks." Not quoting Rabbi So-and-so, to show how well he was acquainted with his writings, but speaking as one who knew what he had to say, and who spoke, out of the fullness of his heart, truth that was evidently inspired; end his hearers felt the force of the solemn message which he thus delivered. Amazed (1605) (ekplesso from ek = out + plesso = strike) (imperfect tense) means strike out, expel by a blow, drive out or away, force out or cast off by a blow. Some versions render it astonished which is a good translation of ekplesso. It is interesting to note that our English word "astonish" which is derived from the Latin word extonare meaning to strike with thunder! What a picture of Jesus' radical message which must have struck His hearers like thunder! Figuratively ekplesso means to drive out of one's senses by a sudden shock or strong feeling, or "to be exceedingly struck in mind". It means to cause to be filled with amazement to the point of being overwhelmed (struck out of one's senses). It encompasses the ideas of wonder, astonishment or amazement. Ekplesso expresses a stunned amazement that leaves the subject unable to grasp what is happening. Thayer writes that ekplesso is "common in Greek from Homer down; properly, to strike out, expel by a blow, drive out or away; to cast off by a blow, to drive out; commonly, to strike one out of self-possession, to strike with panic, shock, astonish; passive to be struck with astonishment, astonished, amazed." Vincent has this note on Jesus' parent's astonishment in Luke 2:48-note writing that amazed is "a very strong word; the verb meaning, literally, to strike out or drive away from; and so to drive out of one’s senses. Hence in the general sense of great amazement. Amaze is to throw into a maze or labyrinth; and so is closely akin to the Greek word here, and is a faithful rendering." Matthew 13:55 "Is not this the carpenter's son? Is not His mother called Mary, and His brothers, James and Joseph and Simon and Judas? 56 "And His sisters, are they not all with us? Where then did this man get all these things?" 57 And they took offense (verb skandalizo - see noun skandalon = stumbling block) at Him. But Jesus said to them, "A prophet is not without honor except in his home town, and in his own household." 58 And He did not do many miracles there because of their unbelief. Matthew 19:25 And when the disciples heard this (Jesus' teaching that "it is easier for a camel to go through the eye of a needle, than for a rich man to enter the kingdom of God"), they were very astonished and said, "Then who can be saved?" Matthew 22:33 And when the multitudes heard this (Jesus' teaching that God said "I am the God of Abraham, and the God of Isaac, and the God of Jacob '? He is not the God of the dead but of the living. "), they were astonished at His teaching. Mark 1:22 And they were amazed at His teaching; for He was teaching them as one having authority, and not as the scribes. Mark 6:2 And when the Sabbath had come, He began to teach in the synagogue; and the many listeners were astonished, saying, "Where did this man get these things, and what is this wisdom given to Him, and such miracles as these performed by His hands? Mark 7:37 And they were utterly (huperperissos = beyond all measure, exceedingly) astonished, saying, "He has done all things well; He makes even the deaf to hear, and the dumb to speak." Mark 10:26 And they (His own disciples) were even more astonished and said to Him, "Then who can be saved?" Mark 11:18 And the chief priests and the scribes heard this, and began seeking how to destroy Him; for they were afraid of Him, for all the multitude was astonished at His teaching. Notice why the chief priests reacted this way: Mark 11:17 And He began to teach and say to them, "Is it not written, 'MY HOUSE SHALL BE CALLED A HOUSE OF PRAYER FOR ALL THE NATIONS'? But you have made it a ROBBERS' DEN." Luke 2:48 And when they saw Him, they were astonished (they were "dumbfounded"! ); and His mother said to Him, "Son, why have You treated us this way? Behold, Your father and I have been anxiously looking for You." Luke 4:32 and they were amazed at His teaching, for His message was with authority. Acts 13:12 Then the proconsul believed when he saw what had happened (Acts 13:8 Elymas the magician blinded by Paul), being amazed at the teaching of the Lord. Note that it was Paul who was teaching and yet the phrase teaching of the Lord indicates it was as if the Lord Jesus were teaching through Paul! God let it be so, that every pastor reading these words humbly depends on a similar spiritual dynamic when they speak Thy truth to their flock. Amen. ekplesso is a very strong word meaning, “to strike out, expel by a blow, drive out or away, to strike one out of self-possession, to strike with panic, shock” in a passive sense “to be struck with astonishment, amazed.” The verb is in the pictorial imperfect, describing the prolonged amazement of the audience. It is in the passive voice, showing that this amazement was caused by an outside influence, the tremendous impact that the Messiah made upon them by the new type of teacher and teaching that met their eyes and ears. The teaching of our Lord was in such contrast to that of the Jewish leaders, that the people saw the difference at once, and were almost beside themselves because of it. What a commentary upon the type of teaching they had been receiving, dry, formal, stereotyped, without power, above their heads, and the powerful, simple, interesting thought-arresting teaching of our Lord. Crowds (3793)(ochlos) is a gathering of a relatively large number of people, a multitude of men who have flocked together in some place, a throng of people milling around or closely pressed together. Teaching (1322) (didache from didasko = to give instruction in a formal or informal setting with the highest possible development of the pupil as the goal; English = didactic = intended to teach, particularly in having moral instruction as an ulterior motive) is a noun which describes the activity of teaching (instruction). In the passive sense didache speaks of the content of what is taught or the doctrine. Ralph Earle (Word Meanings in the NT) writes that "today doctrine has a formal, theological sense that didache does not have." Didache or "the teaching" was that instruction which elucidated the meaning of the facts which were proclaimed. The idea of didache then is to impart knowledge to or instruct someone, for example in how to do something, etc. Teaching or doctrine is that which communicates to another the knowledge of that which heretofore that person was ignorant or ill informed. In the context of the Sermon on the Mount, didache refers both to Jesus' content (which is primarily ethical instruction - contrast kerugma - proclamation, as of the gospel) and the manner of His instruction -- no doubt the crowds were astonished at both. Unfortunately their astonishment says nothing about their personal heart commitment to His Word of Truth and/or their belief in Jesus as Savior and Redeemer. As an aside the early Church compiled its first service order book which was entitled The Didache, or The Teaching of the Twelve Apostles. The Didache dates back to shortly after 100AD. Mark 1:27 And they were all amazed, so that they debated among themselves, saying, "What is this? A new teaching with authority! He commands even the unclean spirits, and they obey Him." John 7:16 Jesus therefore answered them, and said, "My teaching is not Mine, but His who sent Me. John 18:19 The high priest therefore questioned Jesus about His disciples, and about His teaching. Acts 2:42 And they were continually devoting themselves to the apostles' teaching and to fellowship, to the breaking of bread and to prayer. Acts 5:28 saying, "We gave you strict orders not to continue teaching in this name, and behold, you have filled Jerusalem with your teaching, and intend to bring this man's blood upon us." Acts 13:12 Then the proconsul believed when he saw what had happened, being amazed at the teaching of the Lord. 1Corinthians 14:6 But now, brethren, if I come to you speaking in tongues, what shall I profit you, unless I speak to you either by way of revelation or of knowledge or of prophecy or of teaching? Hebrews 6:2 of instruction about washings, and laying on of hands, and the resurrection of the dead, and eternal judgment. Hebrews 13:9 Do not be carried away by varied and strange teachings; for it is good for the heart to be strengthened by grace, not by foods, through which those who were thus occupied were not benefited. 2John 1:9 Anyone who goes too far and does not abide in the teaching of Christ, does not have God; the one who abides in the teaching, he has both the Father and the Son. Revelation 2:14 'But I have a few things against you, because you have there some who hold the teaching of Balaam, who kept teaching Balak to put a stumbling block before the sons of Israel, to eat things sacrificed to idols, and to commit acts of immorality. Revelation 2:15 'Thus you also have some who in the same way hold the teaching of the Nicolaitans. Revelation 2:24 'But I say to you, the rest who are in Thyatira, who do not hold this teaching, who have not known the deep things of Satan, as they call them-- I place no other burden on you. Psalm 60:1 For the choir director; according to Shushan Eduth. A Mikhtam of David, to teach; when he struggled with Aram-naharaim and with Aram-zobah, and Joab returned, and smote twelve thousand of Edom in the Valley of Salt. O God, Thou hast rejected us. Thou hast broken us; Thou hast been angry; O, restore us. IT has been thought by many, that this which is called the Sermon on the Mount, was not delivered at one time, but is only a collection of sayings which at different times were used by our Lord. But, as our Lord went through all the cities, towns, and villages of Judæa, instructing the people, it is reasonable to suppose, that he should frequently deliver the same truths in nearly the same expressions, because the same instructions were necessary for all. The repetition of them therefore, at different times, and at distant places, is no reason at all why they should not now have been delivered all at once, when so great a multitude was attending his ministry, and he had gone up upon a mountain for the purpose of addressing them to more advantage. Moreover, the words before us clearly shew, that this was one continued sermon; or rather, that these were the chief topics contained in it, together with the principal illustrations of them. We shall not enter upon the subject of his ministry at large, but confine our attention to the discourse before us; which, both in the matter and in the manner, appears to have been well calculated to make a deep impression on his audience. [There was an astonishing depth in all that he spoke. His knowledge of the divine law was such, as infinitely surpassed all that even their most eminent prophets had ever manifested. David had acknowledged his inability to explore its depth: “I have seen an end of all perfection; but thy commandment is exceeding broad.” But the height, and depth, and length, and breadth of it were open to the view of Jesus, who saw it in all its spirituality, and in its utmost perfection. He was able to expose and refute all the false glosses with which their most learned teachers had obscured the law; and to set it forth as reaching, no less to the thoughts and intents of the heart than to the most open actions of the life. [The Scribes were in the habit of founding their instructions on their own fallacious reasonings, or on the dogmas of some of the more learned Rabbins. But our Lord appealed to no authority above his own. He reasoned indeed for the conviction of his hearers; but the ground on which he required every word of his to be received, was his own authority; “I say unto you; I say unto you.” In this he differed from all the prophets that had gone before him: they delivered their messages, as from Jehovah; “Thus saith the Lord:”—but Jesus, being himself “God manifest in the flesh, assumed a right to dictate as from himself;” “Ye have heard from others” such or such a thing; but “I say unto you” the very reverse; and require you to receive the word on my authority. To this his hearers were ready to submit: for the miracles which he had already wrought without number had evinced his almighty power and Godhead, and were a standing testimony, that his every word was to be received with implicit faith and unreserved obedience. [The word which we translate “astonished.” does certainly imply a very deep impression made upon their minds. This impression consisted partly in admiration, with which they were filled; and partly in conviction, with which they were penetrated; a conviction of the truth, the importance, and the beneficial tendency of all he had spoken. The novelty, united with the circumstances before mentioned, made his ministry appear as superior to that of others, as the effulgence of the sun is to the light of a twinkling star. One sentiment evidently pervaded the whole multitude, “Never man spake like this man.” At the same time they felt in their consciences, that, if this was religion, they had hitherto been ignorant of it in their minds, and destitute of it in their hearts. [They should have been “pricked to their hearts” with a deep sense of their wickedness, and should have been led to cry out, like those on the day of Pentecost, “What shall we do to be saved?” Without such humiliation as this they could never be truly penitent: they never could abhor themselves, as every penitent must do, in dust and ashes. Young's: for he was teaching them as having authority, and not as the scribes. For (gar) introduces an explanation. When you encounter a "for", always take a moment to stop and query "What for?" Here Matthew is explaining why the crowds were so taken aback by His words and His delivery. As one having authority - Jesus' teaching differed from the "scribes" for many of them limited their teaching to the authorities they cited, and a great part of their training centered on memorizing the received traditions. They spoke by the authority of others, whereas Jesus spoke with His own authority. As explained below, authority (exousia), speaks of the fact that Jesus possessed both the power and the privilege, and in the NT His authority served to prove His sovereignty. Whereas the scribes quoted other human sources to lend a sense of authority to their proclamations, Jesus quoted God's Word, the final authority. Is not Jesus' "template" of teaching still one every pastor and teacher should seek to espouse and emulate? Having (2192) (echo) means possessing or holding and present tense indicates it was continual. comes forth from the carpenter’s shop, where like all other well-trained Hebrew youth, He had learned His father’s trade, and His first public utterance is the most original and revolutionary address on practical morals which the world has ever heard. Authority (1849) (exousia from éxesti = it is permissible, allowed; it is lawful) is "the right to control or command". Exousia literally means to "be out of". Vine says exousia evolved "from the meaning of "leave or permission," or liberty of doing as one pleases, it passed to that of "the ability or strength with which one is endued," then to that of the "power of authority," the right to exercise power...or "the power of rule or government," the power of one whose will and commands must be obeyed by others. In short exousia is "the right and the might". Exousia describes the authority a person has delegated to him from someone else. In legal practice for example, exousia speaks of delegated authority. Exousia is used for the power that proves and reflects the sovereignty of Jesus. Jesus declaration with power was in marked contrast to the scribes who quoted others to lend authority to their teachings. Jesus quoted only God’s Word and spoke as the final authority on truth. He spoke eternal truth simply, directly, with love (in contrast to the bitter hatred of the Pharisees), and without hesitation or consultation. That astounded the crowd. The consciousness of divine authority, as Lawgiver, Expounder and Judge, so beamed through His teaching, that the scribes’ teaching could not but appear drivelling in such a light. Power and authority (right and might, power and privilege) are a recurrent theme in Matthew (see Mt 8:9; 9:6, 8; 10:1; 21:23, 24, 27; 28:18). 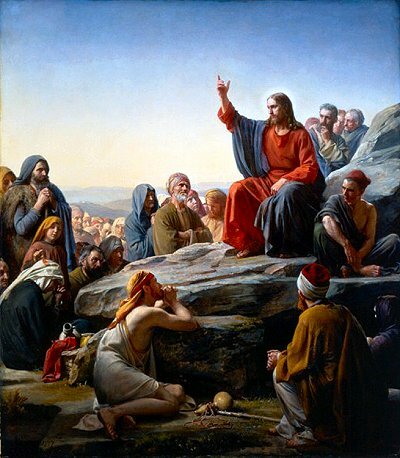 Jesus' authority was unique, and the crowds recognized it even if they did not always understand it. Scribes (1122) (grammateus from grápho = write) literally is a writer (town clerk - Acts 19:35) and was the word used to describe a clerk, a scribe, especially a public scribe, a secretary, a recorder, whose office and influence differed in different states. A writer and transcriber of the law, 2Sa 8:17; 20:25; 1Kin. 4:3; 2Kin. 12:10; 18:37; 19:2; 1Chr. 24:6; 27:32; Neh. 13:13; Jer. 36:12. King's secretary, 2Kin. 12:10, 11, 12; 22:1-14; Esther 3:12; 8:9. Officer in charge of conscription of the army, 2Ki 25:19; 2Chr. 26:11. Instructors in the law, Mt. 7:29; 13:52; 17:10; 23:2, 3. Test Jesus with questions, bringing to Jesus a woman taken in adultery, John 8:3. Members of the council, Matt. 2:4. Conspire against Jesus, Matt. 26:3, 57; 27:41; Mark 14:1; Luke 22:66. Hypocrisy of, reproved by Jesus, Matt. 5:20; 9:3; 12:38; 15:1; 16:21; 20:18; 21:15.
a man learned in the Mosaic law and in the sacred writings, an interpreter, teacher. Scribes examined the more difficult and subtle questions of the law; added to the Mosaic law decisions of various kinds thought to elucidate its meaning and scope, and did this to the detriment of religion. Since the advice of men skilled in the law was needed in the examination in the causes and the solution of the difficult questions, they were enrolled in the Sanhedrin; and are mentioned in connection with the priests and elders of the people.